"Retire into yourself. The rational governing centre is of such a nature that it finds its contentment in its own just conduct and the serenity that it gains from it." I read about this book on someone’s blog and thought it would be interesting to read a book of meditations for the final month of the year. I found reading this book to be a different experience from reading other biographies. I believe this was because it is a collection of private thoughts that Marcus Aurelius never planned to have made public. I must admit I was also fascinated by the idea that many of Aurelius’ thoughts and reflections remain consistent and as relevant today as they were to him 2,000 years ago. Reading his reflections at a traditionally reflective time of year highlighted, for me, the importance of taking time out to reflect and consider what is important to us whilst also striving to be the best we can be. From a professional perspective, it was enlightening to observe that even a leader of the Roman Empire faced similar challenges to leaders today in terms of being self-aware, knowing what is important to them and being able to be authentic in all that they do. "Your principles have life in them. For how can they perish, unless the ideas that correspond to them are extinguished? And it is up to you to be constantly fanning them into new flame." "Each of us lives only in the present, this fleeting moment of time, and that the rest of one’s life has either already been lived or lies in an unknowable future." Quite a few of Aurelius’ comments are focused on the fleeting aspect of time, and that it is therefore necessary to do the important things now. He returns to this concept to note that we should live each day as though it is our last. This should include being authentic and present in the moment, an approach that it is not easy and requires dedication, “Perfection of character requires this, that you should live each day as though it you’re your last, and be neither agitated, nor lethargic nor act a part” (page 69). For me these concepts reflect the importance of now, in that we shouldn’t put off till tomorrow what we can do today and that we need to be present and enjoy the current time and place we are in. Albeit that this can sometimes be challenging, especially given that what is important to me may not be important to others, and vice versa. "All that comes about, comes about justly…Do not act as if you had ten thousand years to live…while you have life in you, while you still can, make yourself good." While Aurelius sees it as important to know your own values and principles, he spends some time considering what it is to be good and just. This was interesting for me as I had thought this concept to be something many of the Roman Emperors didn’t concern themselves with (Caligula comes to mind). I was also interested by his reflecting the importance of choosing how we respond to apparent misfortune and that it is in our own selves (‘ruling centres’) that determines how we respond to events “Do away with the judgement and the notion ‘I have been harmed’ is done away with; do away with that notion, and the harm itself has gone.” (page 25). This is a book to which I will constantly return, if only open it to a random page and see what the questions and reflections are. 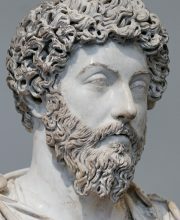 There are many common themes that Aurelius returns to, they are based on the 17 attributes of his mentors and role models that he identifies at the start. This is a book that has inspired me to start journaling again, and to see that even a sentence can start to provide us with a picture of what is important to us over time. It is worth noting that these are the gems I took away with me on this reading, however I remain in no doubt that others might appear more important on reviewing the book in months and years to come. In short, this is a must read for anyone interested in thinking about and developing their own leadership style and their own moral compass, for “the art of living is more like the wrestler’s art than the dancer’s in this regard, that it must stand ready and firm to meet whatever happens to it, even when unforeseen” (67).